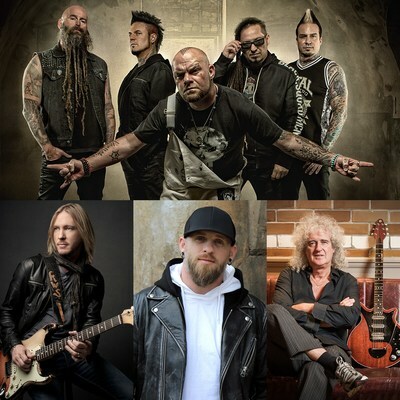 LOS ANGELES, April 12, 2019 /PRNewswire/ -- The multi-platinum rock group FIVE FINGER DEATH PUNCH has teamed up with the legendary BRIAN MAY of QUEEN and two of the biggest names in country and blues rock, BRANTLEY GILBERT and KENNY WAYNE SHEPHERD to record a special version of the song "Blue On Black" mixed by Kevin Churko (Ozzy Osbourne, Shania Twain, Disturbed). Titans in each of their respective genres, the artists came together to merge country and mainstream rock to re-create the classic song originally recorded and co-written by SHEPHERD. Taking Country Rock to the next level, "Blue On Black" is out today worldwide via Prospect Park (North America) and Eleven Seven Music (ex. North America). The song is available HERE and the artists also premiered an official music video HERE for "Blue On Black" showing the creation of the song. Multimedia clockwise: Five Finger Death Punch, Brian May of QUEEN, Brantley Gilbert and Kenny Wayne Shepherd. Download photo: HERE. "Blue on Black is a song my band and I have covered off and on for years... songs are certified timeless when you can come back to them," says BRANTLEY GILBERT. "It's always a staple each night and one of my favorite songs to perform. When the opportunity came up to sing on Five Finger's version, with both Kenny Wayne and Brian May of Queen, I jumped at the chance... Who wouldn't?! It incorporates so many different musical perspectives, but our collaboration just works brilliantly." 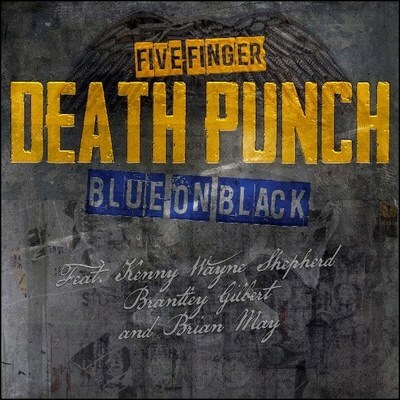 Blues rock legend Kenny Wayne Shepherd adds: "When Five Finger Death Punch approached me about teaming up with them to do a special version of "Blue On Black", I was thrilled to do it. When they told me Brantley Gilbert and Brian May were also going to be part of it, I was honored. This is a powerful collaboration of rock, country and blues artists and a true testament to the commonalities these musical styles share, and I think the fans will appreciate and enjoy it as much as we do." 2018 was a massive year for FIVE FINGER DEATH PUNCH who became the #1 most-played artist on U.S. Rock Radio in year-end radio reports. The group which Billboard described as "a revitalized band with a renewed focus," released their seventh studio album, AND JUSTICE FOR NONE which debuted at #4 overall on the Top 200 Chart and KERRANG! hailed as "…an album that delivers, ticking the boxes of what a modern metal album should be." AND JUSTICE FOR NONE has generated 225 million U.S. on-demand streams, over 360,000 U.S. digital song sales and became the #1 streaming Hard Rock/Heavy Metal Album of 2018. AND JUSTICE FOR NONE marked the group's fifth consecutive Top 5 album release. The album also had four #1 placements on other charts including: Top Digital Albums, Top Rock Albums, Top Hard Music Albums. FIVE FINGER DEATH PUNCH wrapped the biggest North American co-headlining rock tour of 2018 with Breaking Benjamin. With their Summer and Fall tours combined, the bands donated over $250,000 to charities in 2018. Purchase or stream AND JUSTICE FOR NONE by clicking on the link. Five Finger Death Punch have amassed over 3 billion streams to date. BRANTLEY GILBERT has penned and recorded six No. 1 songs, including the CMA Song Of The Year-nominated "Dirt Road Anthem." GILBERT has also earned consecutive platinum albums for Halfway to Heaven, and Just As I Am. Twenty years into his recording career KENNY WAYNE SHEPHERD continues to create genre-defining blues-infused rock n' roll. SHEPHERD, who co-wrote "Blue On Black" with Tia Sillers and Mark Selby, has sold millions of albums worldwide. He has received five GRAMMY® nominations, two Billboard Music Awards, as well as a pair of Orville H. Gibson awards, the Blues Foundation's Keeping The Blues Alive award and two Blues Music awards. He's had seven #1 blues albums and a string of #1 mainstream rock singles. His newest album The Traveler, will be released worldwide on May 31st on Concord Records and Provogue Records (Europe). Brian May, CBE, PhD, FRAS is a founding member of QUEEN, a world-renowned guitarist, songwriter, producer and performer, also a Doctor of Astrophysics, 3-D stereoscopic photographic authority and a passionate advocate and campaigner for animal rights. The following four decades have seen QUEEN amass a staggering list of sales and awards and sees QUEEN remain the most successful albums act in UK chart history. Brian has penned 22 Queen top 20 hits, among them "Who Wants to Live Forever," "No-One But You" and "Save Me," along with anthems "The Show Must Go On," "I Want It All" and "We Will Rock You." Brian most recently returned to his essential rock roots attending the 2019 Rock Hall of Fame to present Def Leppard with their induction into the Hall of Fame and to perform an all-star jam through Mott The Hoople's "All The Young Dudes" with Ian Hunter. Next for Brian is a return to live performances with Queen + Adam Lambert. He will perform throughout North America summer of 2019 followed at the start of 2020 with tours throughout Australia and New Zealand, as well as dates across East Asia. As a producer and executive music producer with Roger Taylor of the Queen biography film Bohemian Rhapsody, Brian and Roger are responsible for one of the highest grossing films of all time across the world and winner of Oscar, BAFTA and Golden Globe awards. The Gary Sinise Foundation honors America's defenders, veterans, first responders, their families and those in need. Through its R.I.S.E. program (Restoring Independence Supporting Empowerment), specially adapted smart homes are being constructed for severely wounded veterans nationwide. Each one-of-a-kind home is customized to ease the everyday burdens of a wounded hero, their family, and caregivers. Other programs include Relief & Resiliency Outreach, Invincible Spirit Festivals, Gary Sinise & the Lt. Dan Band, Arts & Entertainment Outreach, Serving Heroes, First Responders Outreach, and Soaring Valor. Snowball Express serves the children of our fallen military heroes, surviving spouses, and Gold Star families. For more information, please visit The Gary Sinise Foundation.